Delaware County Commissioners support Age-Friendly Community designation initiative led by SourcePoint and in collaboration with the Delaware General Health District. Pictured from left to right, holding the proclamation are Commissioners Jeff Benton and Barb Lewis, Health Commissioner Shelia Hiddleson, Robert Horrocks, executive director of SourcePoint, and Commissioner Gary Merrell. SourcePoint, in collaboration with the Delaware General Health District, and with the support of the Delaware County Commissioners, seeks to designate Delaware County an Age-Friendly Community, according to Robert Horrocks, executive director of SourcePoint. The World Health Organization, in partnership with AARP, has developed a network of Age-Friendly Cities and Communities to encourage active aging. SourcePoint and the Delaware General Health District seek to assist Delaware County leaders in creating a community that supports healthy aging, and in so doing, improve the health, well-being, satisfaction, and quality of life of older residents. Age-friendly or livable communities have walkable streets, housing and transportation options, access to key services, and opportunities for residents to participate in community activities. 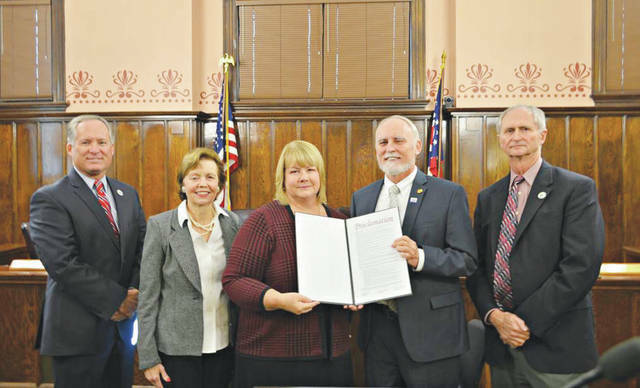 On Monday, Nov. 6, Delaware County Commissioners, Jeff Benton, Gary Merrell, and Barb Lewis, signed an official proclamation endorsing and supporting the initiatives led by SourcePoint. The age-friendly project will take five years to complete and begins with an extensive membership assessment, in which the community’s strengths and weaknesses are identified in relation to eight domains of a livable community as identified by the World Health Organization. The domains include outdoor spaces and buildings, transportation, housing, social participation, respect and social inclusion, civic participation and employment, communication and information, and community support and health services.